This 41 year old female patient initiated d4T/3TC/EFV in February 2008. Her baseline CD4 cell count was 14 cells/ul, WHO clinical stage 3 and weight 94.3kg. She was on TB treatment (Rifafour) at the time of ART initiation, having started two weeks previously (for smear negative pulmonary TB); she completed TB treatment in August 2008. She had an excellent initial virological and immunological response to ART. In April 2009 she was seen with a history of drop attacks. The medical officer was concerned that these might be related to EFV and switched this to NVP. She now reports that she continued NVP 200mg once daily for 3-4 months until she was informed that this was incorrect and then she increased dose to 200mg bd. The patient first two viral loads show a very good response to ART. Her last three consecutive viral load were above 1000 copies/ml indicating treatment failure. She has had a remarkable improvement in CD4 count during her first two years on ART. However her last CD4 count is suggestive of immunological failure. This individual has resistance to three of the four ARVs that she has been exposed to and two of the three she is currently on. She has high-level resistance to NVP and EFV due to the NNRTI mutations K103N and V108I. 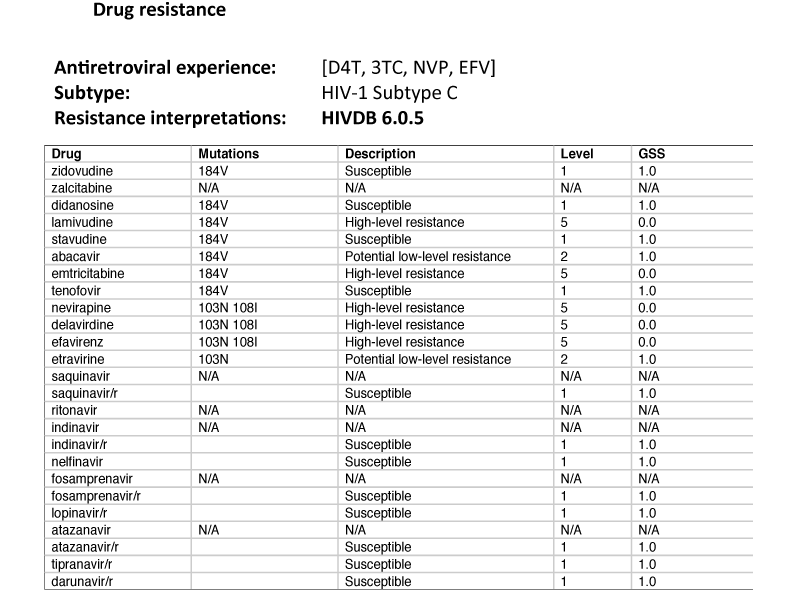 She also has high level resistance to 3TC due to the NRTI mutation M184V. She has no TAMs and no mutations associated with tenofovir (TDF). In the absence of major NRTI and NtRTI mutations, this patient should do well on a standard second line regimen consisting of TDF, 3TC and LPV/r. She can also use a regimen of AZT, 3TC and LPV/r but since her body mass index (BMI) is more than 27, increasing her risk of hyperlactataemia, TDF will be the preferred option. What dose of NVP should she have been started on when switching from EFV? Why is it recommended to continue 3TC when the resistance test shows high-level resistance? I. Once a patient has been on medication like EFV that induces the hepatic cytochrome P450 system, for longer than 2 weeks, there is no need for a lead-in dose of NVP. This patient should therefore have started on a full dose of NVP i.e. 200mg b.d. II. Continuing 3TC will maintain drug pressure that ensures the persistence of the M184V mutation. This mutation is known to reduce viral fitness, delay the development of TAMs, increase susceptibility to AZT and decrease the IC50 of TDF. There is also considerable evidence that 3TC continues to contribute to the effectiveness of ART even after the development of the M184V mutation. I. When switching from EFV to NVP, there is no need for the lead-in dose of NVP, dose should be 200mg b.d.